For all the high-flying showmanship and unexpected brilliance of Florida Gulf Coast’s NCAA Tournament run, and the commensurately growing coaching legend of Eagles head man Andy Enfield, there were skeptics, and most of those skeptics brought forth the same boring but altogether legitimate grievance. Are we really supposed to believe a one-week wonder from Fort Myers, Florida has all of a sudden, by virtue of a fluky Cinderella run, morphed into a prime candidate for a high-profile power conference job? Who made Enfield the next great on-court tactician, something more than a laissez faire personality who unleashed a group of young and brash and under-recruited athletes on an unsuspecting NCAA Tournament? Wasn’t Dunk City more about Brett Comer and company than Enfield himself? 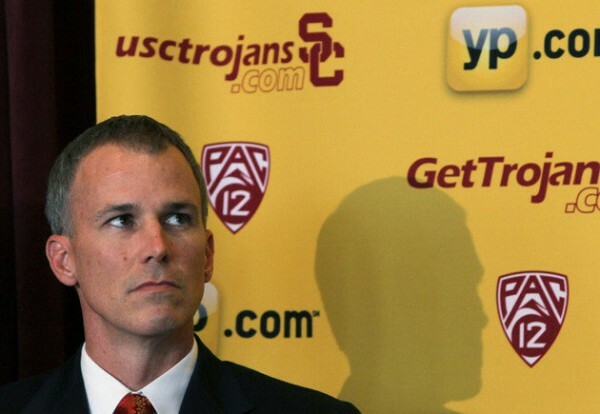 If there are any misgivings about USC hiring Enfield, he’s on the right track toward proving why the Trojans made the right choice (Getty Images). It is easy to see how Enfield could get tabbed with the “one-week wonder” label. The NCAA Tournament can accomplish many things. One of the most timelessly pervasive is the elevation of otherwise lesser-known coaches into consideration for more prominent jobs. Steve Alford’s No. 3 seed New Mexico lost to Harvard in the Second Round of the NCAA Tournament; UCLA paved the way (forcing Alford to renege on his 10-year contract extension almost immediately) for his arrival. Florida Gulf Coast beat Georgetown and San Diego State; Enfield got a pay raise, a basketball program with promise (if not actual historical success) and a new California lifestyle to boot. March is a magical time. So it was always going to be interesting to see how Enfield would take to his new position, especially in these first few months. Well, the early returns are in, and so far Enfield has doubters doubting their own doubts – as in, “well, well, looks like this Dunk City thing is legit.” How right you are. Enfield may have won two NCAA Tournament games with lesser talent, but to build a truly sustainable winner he’ll need to penetrate the West Coast recruiting scene with the same vigor as Ben Howland during the Bruins’ recent thrice-returning Final Four heyday. After less than a month on the job, Enfield has already considerably helped his chances. News came down last week that Enfield hired local assistants Tony Bland and Jason Hart, two young and active prospect-hunting presences on the West Coast with strong ties to the area’s top high school talent. Bland in particular was the recruiting brains behind San Diego State’s recent talent surge under Steve Fisher, and Hart has a nine-year NBA pedigree along with coaching experience at the high school, college and AAU levels. CBS Sports’ Gary Parrish reported Enfield is likely to round out his staff with Kevin Norris, one of Enfield’s assistants at FGCU. The players are what matters in the operational calculus of any hoops program, obviously, but before Enfield can start butting heads with Steve Alford and the Bruins on the recruiting trail, picking up experienced and localized assistant firepower is a prudent and timely way to kick things off. Enfield hasn’t proven anything at this stage of the game; for all we know, he’s a just-OK coach who piloted a super-hot 15-seed through a magical two-game run in the NCAA Tournament. Landing two top assistants, and rapidly so, is a reassuring sign that maybe Florida Gulf Coast was just a little more than a free-flowing offense and an upset-vulnerable Georgetown team — with the Wall Street and supermodel narratives artificially imposed on top. Enfield is giving every indication he can succeed at a historically tough job with a historically agnostic fan base and a historically second-rate batch of West Coast Talent (O.J. Mayo sold separately…). Better yet, he’s doing it the only way any powerhouse program of lasting import can build and prolong high-win seasons and NCAA Tournament wins – he’s building from the ground up. The implications of this move may not come into clear focus until later this year, when the 2014 commitment cycle hits full bloom. In today’s world, Enfield’s hires are symbolic, but the future they portend is an extremely bright one. Enfield has Tournament-crafted stardom, a mediocre but potentially brimming program and a playing style that basically recruits itself. Add two of the West Coast’s best recruiters to the checklist. One-week wonder? I think not. This entry was posted on Wednesday, April 17th, 2013 at 10:30 am by Chris Johnson	and is filed under coaching carousel, commentary. Tagged: andy enfield, coaching carousel, florida gulf coast, jason hart, tony bland, usc. You can follow any responses to this entry through the RSS 2.0 feed. You can leave a response, or trackback from your own site.